I could cheat and reset the height to 382 (its really 301mm measured) and work from that, but im guessing everything I print will then come up short. when I measure the x/y distance to rep its 50mm in rep to 49mm measured, so not too bad... its just the Z axis thinks its bigger than it actually is. 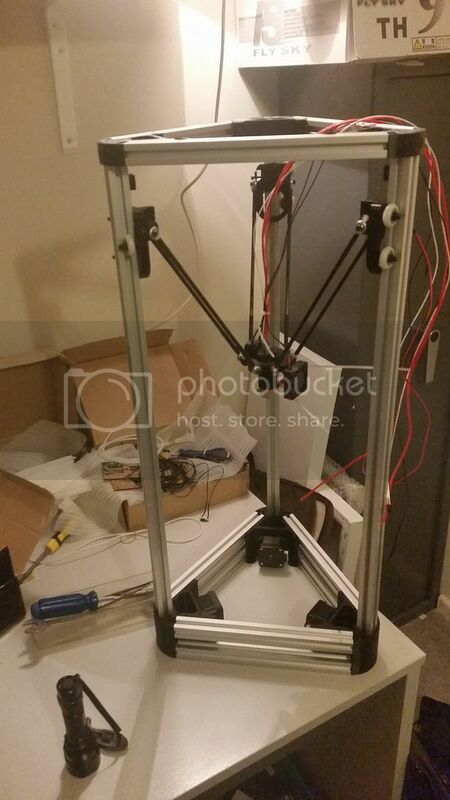 this was a cheap Chinese mini kossel delta kit from ebay/aliexpress from 2.5 yrs ago...support seem sketchy at best, things have moved on from that. do you mean v1.16 was the firmware factory installed ? or did you install it ? Thanks Gaz. I get how to set the height what I don't get is how to correct the fact that my true distance between nozzle and bed is 301mm yet to get the nozzle down to the bed I have to travel 382mm in repetier. I don't know how to calibrate true distance to rep distance, im guessing it's in the 80 steps part but can't seem to find much in it. I have uploaded my board using marlin 1.6.13.it's a mega 2560.
ok, but wont that change the x and y dimensions on rep too? this picture was taken ages ago before I finished it. movement was down and forward, its clear for a delta they need to be the same. bed is now level too and no rise/drop on x/y. Extruder next to test now, but if that's out then that's and easy change. I will start to mess around with PLA tomorrow if all goes to plan. Page created in 0.061 seconds with 35 queries.